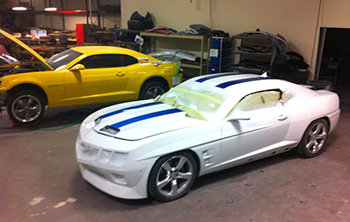 We are experts in the Auto Body and Collision Repair business in Southern Nevada. Our goal is to provide every one of our customers with an unconventional approach to auto repair, resulting in not only 100% customer satisfaction, but the safest repairs available. We are an independent; family owned and operated shop.For us, Ideal Auto Body is not a job, or occupation, or even a career. It’s our PASSION!!! And the reason why we’re here is to help you customize, or repair your car, the way you want it done. Ideal Auto Body offers the most current “state of the art” equipment and techonlogy to ensure proper repairs and finish results that will keep you coming back to us. Our employees retain the most up to date certifications in all facets of auto body repair and we continue their education regularly to keep up with the constant changes in auto manufacturing. A few of our customers have even referred to our technicians as “artists” after seeing their cars repaired. From bumper repairs to heavy collision, Ideal Auto Body does it all. And because we are a preferred (or DRP) repair facility for most major insurance companies, Ideal Auto Body can handle your claim and repairs completely. From helping you file your claim, to getting you a rental car, to finishing the repairs, and dealing with the insurance companies, we often relieve a lot of the stress that comes with an accident. Please take a look around to see some of our celebrity repairs/custom work we have done, our before and after photos, current media promotions, and our ever popular Internet specials. Thanks for visiting Ideal Auto Body of Las Vegas.